Follow @mcphoo Tweet Set point theory is crap. I channeled Lyle McDonald for the title of this article. Why? Because McDonald has a reputation for cutting through the Poo to the real stuff in health and well-being stuff, and set point theory is the big poo, not the true doo and it's used to enable psuedo science and pain. Enough! So i want to get to the real stuff here, but i fear i don't have the patience - this topic gals me so. Suffice it to say that what's got my dander up is that there's an NHS eating disorder clinic in the UK that is promoting coming to grips with one's body image by promulgating Set Point THEORY. The programme devised in schools by the Eating Disorder Unit would include education about set points. Set point theory is derived from the observation that the body regulates its weight much as it regulates its own heat. Experiments involving the starvation and feeding of rats have shown there is a biological resistance to permanent weight change. The body will compensate for being starved to retain its natural weight. That explains why dieting can make people fatter as it interferes with the metabolic rate. It also explains why dieters tend to put back on weight they have lost. 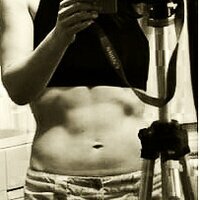 It is to do with the physiology of the body rather than lack of will power. "Some people don't like set point theory because it means accepting being heavier than they want to be," says Pam. This explains why sometimes a little bit of research goes a long, wrong, stupid way. Some people don't like set point theory because it's WRONG at least in terms of how it's used. First, set point theory didn't start, as far as i can tell, in metabolism studies or bioenergetics, but in an area of psychology (and socio-economics) called Subjective Well Being. It's about 30 years old, looks at why there seems to be a personal emotional set point, not a biological one for adipose tissue. What i can't find is who first tried to apply this psychological approach to biology and fat cells in particular. And even in psychology, the approach is being called into question as the data to support it just doesn't seem to be showing what set pointests have said it shows. So what's wrong with set point theory? SPT suggests that if you're fat you're gonna stay fat because the body will do what it can to preserve its prefered state. So what? we become fat because our fat cells want us to keep them enlarged to a certain size and number a certain number? we are fat cell slaves? The set point theory holds that obesity entails a metabolic defect that functions as a homeostatic mechanism. This defect is supposed to result in a slowdown of resting metabolic rate in an overweight or obese individual who has lost weight. 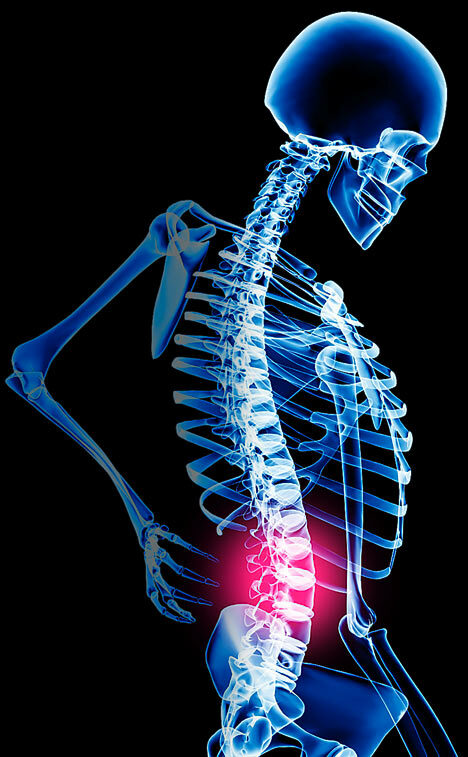 The resultant reduction in energy expenditure is said to be responsible for the often-observed scenario in which the individual regains the weight that was lost and thereby returns to his or her set point. scientific support for the set point theory is limited to old data derived from outdated methods of physiologic measurement. Note, this is a 2003 summary. The Birmingham NHS Eating Disorder Center article is from Feb, 2008. Please, wake up and smell the millennium: the ideas are burning. Yes indeed, there are loads of signals that say when we're trying to lose weight "don't do that! protect the fuel!" - especially if we're heading towards starvation levels (50% of daily caloric needs for maintenance or of course less). But a lot of these homeostatic responses (must eat! starving. grr. find cave!) are trainable. In other words they can be modified by learning new habits that help recognize and make new eating behaviours safe, and chemically ok. There are values to those refeeds! Now i'm not getting into some deeper level of neuro-bio-mechanistic whatever that says some day we may find the weight gene that wants us not to drop below a certain level (though i had to read Kafka's the Hunger Artist too many times in literary studies to believe that, fiction or not) or that wants us to be a particular weight, but so what? Right now, the biggest impact on our "set points" (which amazingly oh my have gone up over the past decades right across the west, and right into the east, and does that have anything to do with more crap food availability or have we just started to evolve into blimpoids?) is our behaviours around all too accessible food. In a comparison of breakfast servings, the students in 2003 took 20% more cornflakes than students took in 1984, Schwartz said. Ditto for milk. The glass of orange juice grew by more than 40% compared with 20 years ago. That translates into 50 additional calories, or a weight gain of five pounds over the course of a year, if consumed on a daily basis. Dinner and lunch servings grew, too - 50% more fruit salad wound up on the plates of the Rutgers students. "Plate size, bowl size, cup size are very deceptive," she said. "They can't estimate the amount of food in a dish and it makes it even more difficult when the dish is deeper or bigger." A 1994 informal survey found that the standard plate size in the restaurant industry grew in the early 1990s, from 10 inches to 12. And of course there's the whole "super size me" culture. To counter act these super sizings, there are some great alas less well know sites that try to help put portions in perspective. Like the Picture Perfect Portion Slide show. 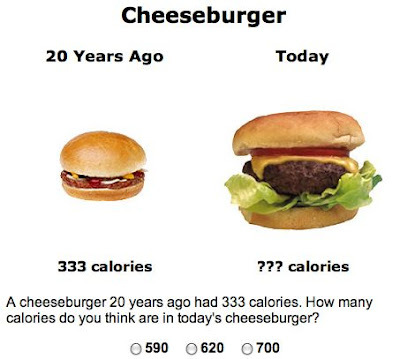 Or the proportion distortion web site, where one looks at say a cheese burger from 20 years ago, sees its calories next to a Today Cheese Burger and has to guess its calories. THEN you get to guess how long it would take to burn off the caloric difference (the answer to this one is 1.5 hrs of weight lifting). There's even been research into how well the above approaches have helped people get a handle on better portion estimation. Result: in their current form, they sensitize us to food size differences, but don't yet help with appropriate estimation of sizes/calories alone. The main point though is gosh, do ya think that if portions have increased by 40-50% over the past two decades, that that might also be why our supposed biologically set, set point has gone up, too? and hence, gone up in smoke? Just a question. It seems that we're wired to hoard fuel when it's available. Wen more is available, we tend to go for more. This is what work by SB Roberts and colleagues, as well as by Wansink and others has been showing. Solution: LOOK AT WHAT WE'RE eating, when we're eating it and how we're eating it. We need better habits around abundance. This is what i like about precision nutrition - it's habit based (review)rather than calorie based. It includes ideas on food prep and meal planning. There are other books *around* eating habits now that don't suggest what to eat but how to think about eating. I'll come back to those. Suffice it to say, set point is more set in our ways. And that's really really understandable. It's hard to go against wired to hoard store and flee. But we can. And it's what Lean People do. Maybe part of it is to get that there IS more, there will be more, we won't starve and it's natural to feel hungry - more natural to feel hungry than not actually - and we won't break if we don't eat. Move. Easier said than done, i know. That's why i've proposed "just change one thing" - that will get us to the eating less we need to burn off excess fat. Cuz at the end of the day, when it comes to weight loss, it's set point shmet point, thermal dynamics conservation of energy law (emphasis on Law not Theory) still rules in nutrion. The tough stuff is getting to the behaviours that will let us go against well practiced (set?) habits and let us get to that desired caloric deficit for body comp change for health and well-being. I guess it's easy to see why set point theory seems to hold true when you consider the "set" behaviours that we don't get around to permanently iresetting. sharing this information.And I’ll love to read your next post too. This article just pure angers me. You've provided no clinical research of evidence that what you're saying is even remotely a fact, no matter how much you 'italic' it. There are many men and women who right now are recovering from eating disorders who can vouch that the set point theory is correct, why? Because unike yourself, they are actually seeing it happen with their own bodies. This article is just your single opinion, you are of course entiled to that but please don't write bogus articles preaching to others just because you feel the need to control your own weight yourself. It seems to me like you're on the restrictive eating disorder spectrum yourself, please, get some decent food in and let your brain get a little more nourishment before you post again. I do agree that portion sizes are out of control, however a well feed body won't eat every last bite of a meal bigger than they need, no one is forcing them to eat everything. Our bodies are a lot smarter than you make them out to be, maybe your should get in touch with your own instead of trying to control it so much, it might just amaze you. Yup, i really hear your anger, RoseElle. If you'll look you'll find that the article does in fact reference quite a few studies and experts, so not quite my single opinion. I have no argument with homeostasis, but supposed "set point theory" largely attempts to isolate out the hedonic component of responses to food. It's very difficult therefore to get at what a "homeostatic only" point would be for bodyweight when there are hedonic interactions toujours deja at play. For more references here, you may be interested in work by Susan Roberts of Tufts Univesrity. Here's an example. I would be much more willing to take you seriously if you knew how to capitalize your Is. Seriously, if you're going to criticize a scientific hypothesis backed up by a lot of research, at least have the decency to use proper grammar. Conventions of capitalisation are not grammar, ArkhamA. i make a deliberate choice not to capitalise "i" - if that is sufficiently incendiary for you that it strikes at a sense of "decency" and suggests that the content is compromised by the form, ah well, that's your stuff right now, your process right now, is it not? You may not be alone. Others have been triggered by that re-vision or presentation. Isn't that interesting? Best with your movement.